The season is over. The potatoes are dug, as are the carrots and the dinky onions. The kale, while green right up until an arctic front settled over us and drove temperatures below zero, is done for the season. The leaves of the cherry tree abruptly turned and dropped last week, after having lingered for the two months since our first frost on September 11. I ate one cherry off that tree this summer. By the time I’d noticed that the Stellar’s jays and robins and who-knows-what other birds had finally, after almost a decade, figured out that tart cherries are tasty, there weren’t enough left on the tree to cook anything with. I ate my lone cherry just to maintain my claim, and let the birds have the rest. Although I potted up tomato seeds and managed not to kill off the seedlings during hardening off, as is my habit, the plants were slow to get going and were just hitting their stride in early September. So: no home-grown tomatoes on our salads this year. I did manage to pick one zucchini before the plant froze. The horses are finally getting their share of the garden crops, though: carrot tops. My little red horse Moondo is fond of bitter greens, and eats his daily handful of wilted fronds with enthusiasm. Jake, my husband’s big gray, has a sweet tooth and is less appreciative. He’ll accept the greenery, but the look on his face calls to mind that of an eight-year-old boy who has just unwrapped a package of tidy whities on Christmas morning: Really? This is what you got for me? 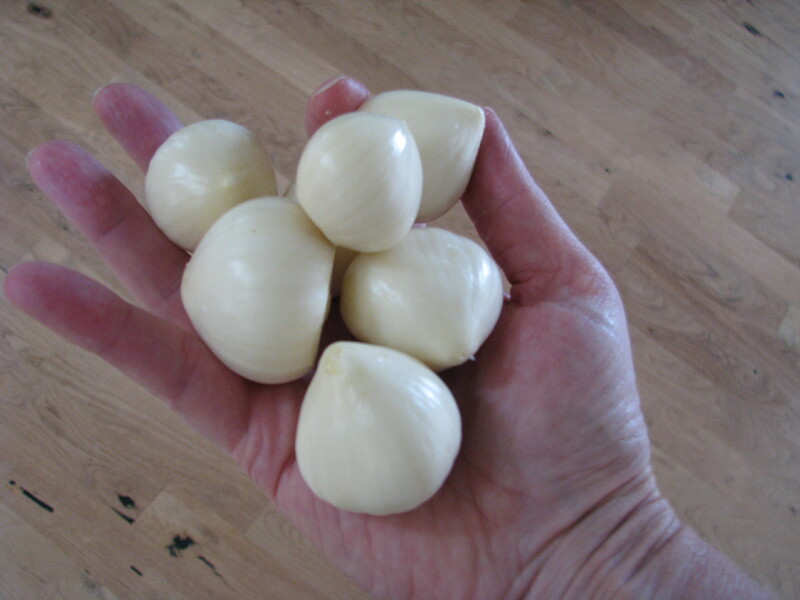 Some of my giant garlic cloves. After neglecting to plant garlic last fall, I broke up a few old heads and shoved the cloves in the ground in late spring to see what would happen. The tops quickly popped up, the green spears stretched…and then withered early. The resulting harvest of a couple dozen heads seemed like a good outcome, although half of the heads didn’t bother to divide into cloves, just swelled as single massive bulbs the size and shape of figs. And for whatever reason, the garlic itself turned out to be dynamite—as in powerful. When I used one half of one (normal) clove in a roasted eggplant dip, the result was so potent that we couldn’t eat the stuff, and I ended up using the dip to thicken a soup. I regarded the remaining garlic heads with trepidation for while, before deciding to cook the whole mess down in my version of roasted garlic. I broke up all the heads, peeled the cloves, cut the oversized ones down, and simmered it all slowly in olive oil, ending up with a quart of garlic confit packed in flavorful oil to use over the next few months. I usually do well with beets, which I like growing both for their ease and because they’re a two-fer—or a three-fer, depending on how you look at it. I pinch leaves off for salads and sautés throughout the summer, before harvesting the beetroot, at which point I’ll get more greens. When I went to clear the beet patch, I pulled up two golden beets about the size of a ping-pong ball; all the other plants weren’t much bigger than seedlings. The full crop of baby greens went into a single potato-and-dinky-onion hash—and even then I needed to supplement the greenery with kale. And so it goes. The misadventures stack up, partly a result of a harsh environment and short growing season, but also due to the fact that I am my own gardening challenge. I plant too late, am stingy with water, especially when memories of drought years are still vivid. I’m not vigilant when it comes to pest management, staking, pruning, thinning. I make the same mistakes over and over. But the failures always seem to match up with, if not a success, then an oddball surprise. The crate of multicolored potatoes made up for the lost beets. The birds ate the cherries, but they still haven’t learned to go after the tiny white alpine strawberries. 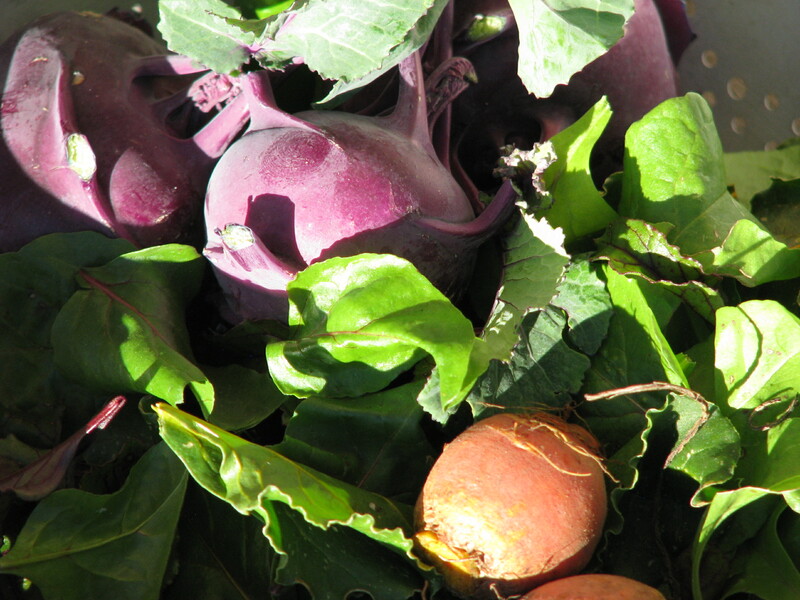 For the lettuce and spinach that didn’t bother to sprout, there’s red kale…and dinosaur kale. Although frost killed the tomato plants, most of the green tomatoes were basically unscathed, so I picked them, cooked them down, and stashed them in the freezer for baking experiments this winter. And, as they usually do, the snow peas grew, produced, and grew some more. Underneath a canopy of frostbitten foliage, new tendrils and even blossoms have kept unfurling since September. I picked a colander full of the most tender of the new shoots, and on the same day I called the garden season at an end, we dined on bright green pea tendrils. Whether their herbal notes on my tongue were a reminder of this past spring or a promise of the coming one, I can’t quite decide. This entry was posted in change of seasons, fall, gardening and tagged cherry tree, garlic confit, pea tendrils. Bookmark the permalink.